I took a shower today, and with immense satisfaction noted that immediately after I turned the water off, the tub was glisteningly empty. Normally, that’s not something that most people take great pride in. But I have reason to be proud. I have long hair. (These next couple of paragraphs may not be for the squeamish). So, when I wash it, inevitably, hairs are shed, and make their way towards the drain. Some time ago, the water was increasingly slow to drain…recognizing the hair issue, I would unscrew the plug and with tweezer, pull this disgusting blob of hairy yuck up and throw it away. And things would get sorta better… For a little while. So I would make a deliberate effort to clean out from just under the plug regularly. Regular maintenance and effort, I thought would cure the problem. It’s an unfortunate thing, really, when the tub doesn’t drain quickly…when the water sits in the tub for a while, soap scum and other gross stuff builds up around the tub (I told you this part wasn’t for the faint of heart). Not being someone who has the time or energy to give the tub a full scrub every time after anybody in the household showered, I took to keeping the shower curtain closed to hide the ugly effect. Oh, yeah, that hides it, but doesn’t really fix it. I had to do something. Hiding seemed a reasonable option…scrubbing it daily in the morning before work just isn’t feasible. The problem began to get rather ridiculous, and I realized that my under the plug maintenance was important, but no longer significantly effective…the problem clearly lay deeper. So, I brought out a “big guns”. I found this long barbed flexible plastic stick at the hardware store that reaches way down the pipe, and pulled it back…the barbs grabbed the gunk and pulled out a long disgusting mess of yuck outta the drain. I did this several times until this stick came back up clean, digging far below the surface of the tub. I was thorough, cuz I wanted this thing to drain properly. Going way beyond to a depth I hadn’t gone before was bringing up stuff I didn’t have access to–but needed to be removed. The whole thing drains like a charm. Oh, and I’m leaving shower curtain open during the day. Feels great. The whole things gets air, the room feels bigger. I’m not hiding anything anymore. As I was standing there admiring the draining qualities of my tub today, I had pause to think about my clients who come in, confused with why something has bothered them so much. They are clearly distressed by something upsetting, but even in the midst of it, it seems out of proportion to what is happening. Therapy helps a person connect with and make sense of the deeper issues that get bumped and reinjured with a current assault of some kind. A misunderstanding at work triggers huge uncertainty about one’s value, and triggers feelings of worthlessness, loneliness, and failure. One might fear getting fired, and lose sleep at the same time recognizing that the boss is making comments that suggest your continued overall positive contribution to the company. Counselling can allow a client to explore, with the assistance of skilled counsellor to provide knowledgeable support and facilitation, the understanding of the deeper wounds that activate those powerful feelings. Once those are understood, a therapist can help a person to transform and heal those wounded parts and release the power that they have over a person. A person has the innate ability to do this, but having someone join for the journey provides adds understanding and insight. 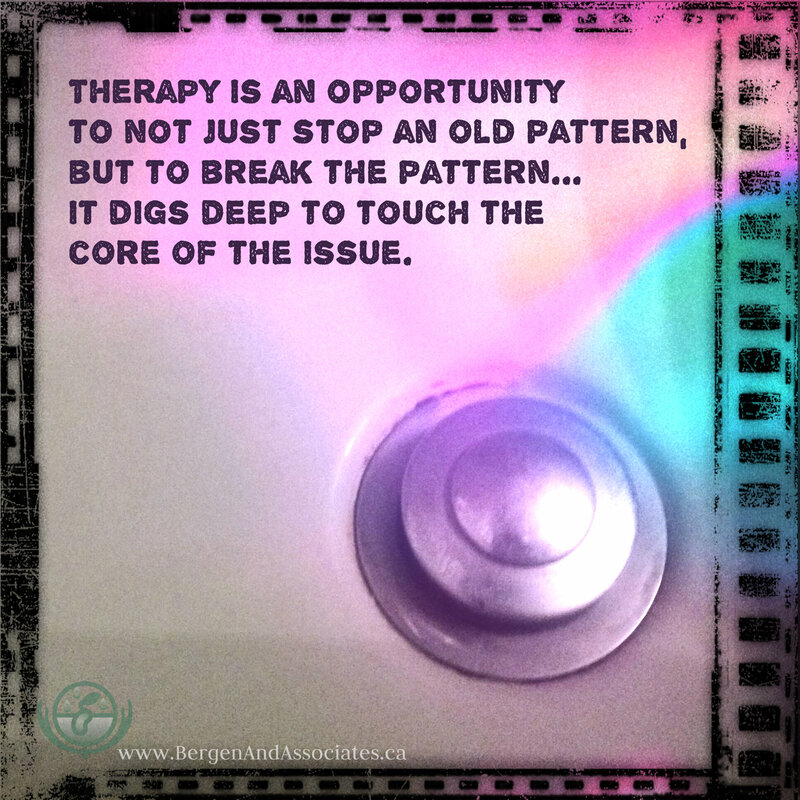 Therapists help clients take charge of their own story, to become the author of their story. Therapists work with clients to discover how there may be distortions to the story that have been unconsciously created and hijack the story. So…us therapists are like the hardware store tool that can reach deeper into the soul than the tweezers. It’s a privilege to watch someone transform their anxiety over a great number of things to being able to giver themselves powerful postive messages that are genuinely meaningful and be able to feel truly calmer…to notice that which evokes anxious feelings and to have a completely different perspective which allows that anxiety to feel less intense and not hijack a person’s experience. It’s really wild to watch someone have a discussion with a therapist to reach some deeper level of understanding and insight that changes how they perceive themselves and the situation…creating space for self compassion and a different internal dialogue. How well is the water draining in the drain of your life? Want some help with flushing it clear by going underneath?